Hey Hayward! : For God's sake, we're renaming city streets after churches now? For God's sake, we're renaming city streets after churches now? Quite by accident I tuned-in to last week's Hayward City Council meeting in time to hear the Council approve the renaming of a public street to that of a church. Forselles Way is a city owned, tax-payer maintained, thoroughfare that connects Tyrrell Avenue with Tampa Avenue. It's only about a quarter-of-a-mile long and flanked by eight privately owned parcels. Only three of these parcels have Forselles Way addresses, all of which are mixed use developments primarily consisting of residential apartments. A former Hayward mayor owns one; a corporation owns the other two. Both (i.e. all) of these immediately impacted property owners The former mayor and her property representatives objected to the name change at the council meeting. Despite this, the council members unanimously sided with the church. Now the objecting property owner and twenty tenants are obligated to change their addresses. Correction: It was originally stated that the corporate property owner also objected to the name change at the council meeting. It did not. Map of Forselles Way (gray cross-hatching). Yellow shaded parcels are the only ones with a Forselles Way address. The owner of the smallest yellow shaded parcel opposes the renaming of Forselles Way to Glad Tidings Way. Never mind respecting property owner's rights, how about having some respect for the separation of church and state? The concept, after all, is only defined by the very first line of our Constitution's First Amendment, i.e. the Establishment Clause. Incredibly, the City Attorney asserted at the meeting that Council's approval of the name change is not in conflict with the First Amendment, because it doesn't recognize or choose one religion over another. This is precisely what it does. 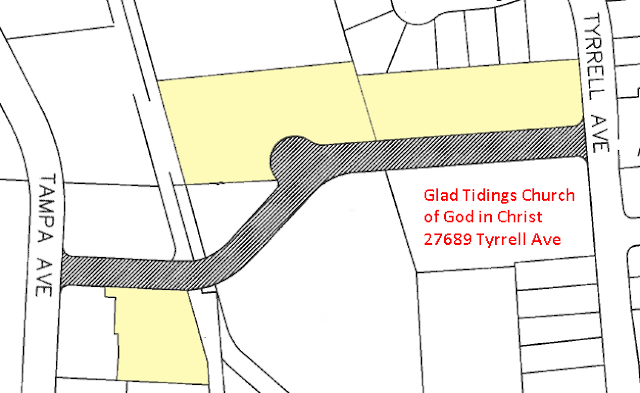 By rechristening the street with the church's name, the Council is not only recognizing Glad Tidings Church, it's chosen to promote it over all others. Or are we to understand that the Council plans on equalizing things by further renaming streets to recognize other religious establishments in the city? Considering that there are scores of religious organizations in Hayward, many sharing the same street, things might get rather interesting. Pandora's box has now been cast wide open. What if the former mayor, who happens to be a champion of the Jewish faith, invites a rabbi to establish a synagogue on her Forselles Way property? Does the Council believe it's proper to force a Jewish institution, or even just a citizen of Jewish faith, to accept a street name that, according to the King James Bible, means preach God in Christ? It should be obvious that the new name will have a chilling effect on the desire of other religious organizations and even citizens of other faiths to locate on the street. This equates to a form of discrimination--a blatant violation of constitutional rights. And if the Council's decision isn't offensive enough, consider the manner by which the City advanced the cause. It too is similarly egregious and most definitely suspicious. First, the City didn't even intend to have the matter heard or discussed by anyone at all. It was buried within the Council's 'consent agenda'--the part of the meeting where numerous routine, supposedly non-controversial issues are voted on as a whole, all at once, without discussion. In this particular instance, it was Item #8 in a group of 20 "routine" items. Had it not been for the in-person objections, the name change would have been approved with hardly anyone noticing at all. Secondly, it seems oddly convenient that a decision that might subsequently be challenged was scheduled for the last typical Council meeting before its summer break. The next opportunity for the Council action to be redressed is September 15, 2015--after the new name has most likely been implemented. Next, isn't it peculiar that there isn't any discussion of the glaring First Amendment issue in the Council Staff Report? Isn't it also odd that none of the Council members inquired about it? It wasn't until the presiding mayor made her closing remarks that she awkwardly alluded to a non-public discussion on the matter, apparently introduced by an email message that remains undisclosed. She then asked the City Attorney to weigh-in, where he provided the comment previously mentioned. Curiously, the Council's meeting webpage doesn't include the referenced message. It only links to correspondence in support of the name change--one from the Police Chief of neighboring Union City and another from a former Hayward School Board President. 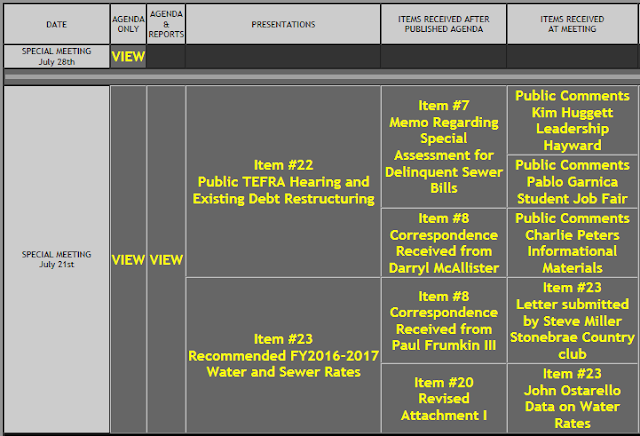 Screenshot of the Council's meeting webpage that shows it providing links to only correspondence in support of the Item #8 name change, but not to the inquisitive message alluded to in the meeting (7/28/2015). Click the image to visit the Council webpage. Finally, at the end of the discussion and just prior to the vote, the presiding mayor actually thanked those responsible for bringing the name change request to Council. She also said she was sorry that the issue had caused such dissent and hoped that differences would be resolved as we all move on. Kumbaya, Madam Mayor. Kumbaya.